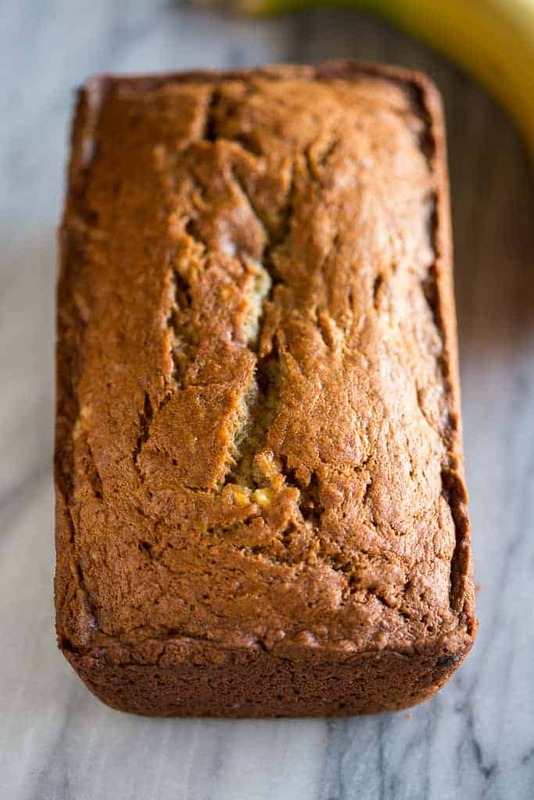 Our family’s very favorite Banana Bread Recipe is EASY, moist, and simply perfection! Look no further for a fool-proof banana bread recipe that turns out perfect every time. 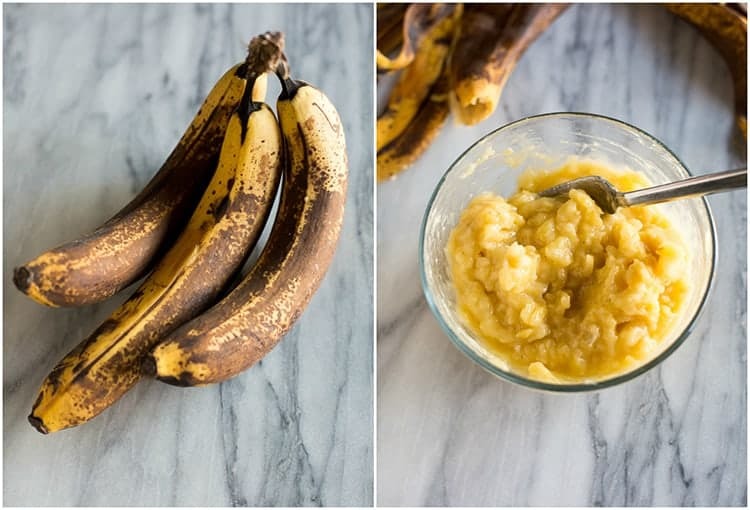 I first shared this banana recipe way back in 2010. It’s one of those “staple” recipes in my collection that I’ve made a thousand times. I love how simple the ingredients are and how easy it is to make. If you’re looking for a healthier banana bread recipe then be sure to check out my very popular Skinny Banana Bread! In a small bowl mash three ripe bananas with a fork. In a large mixing bowl, cream the sugar and butter until it gets a light and fluffy texture. Add the eggs one at a time, beating well after each addition. Next, mix in the mashed bananas and milk. In another bowl, mix together the dry ingredients: four, baking powder, baking soda, cinnamon and salt. Add the dry ingredients to the creamed sugar mixture and stir until the batter is just combined, but don’t over-mix it. Pour the batter into a greased 9 x 5 x 3 inch (or similar size) bread loaf pan and cook at 325 degrees for about an hour, or until a toothpick inserted into the center of the loaf comes out clean. 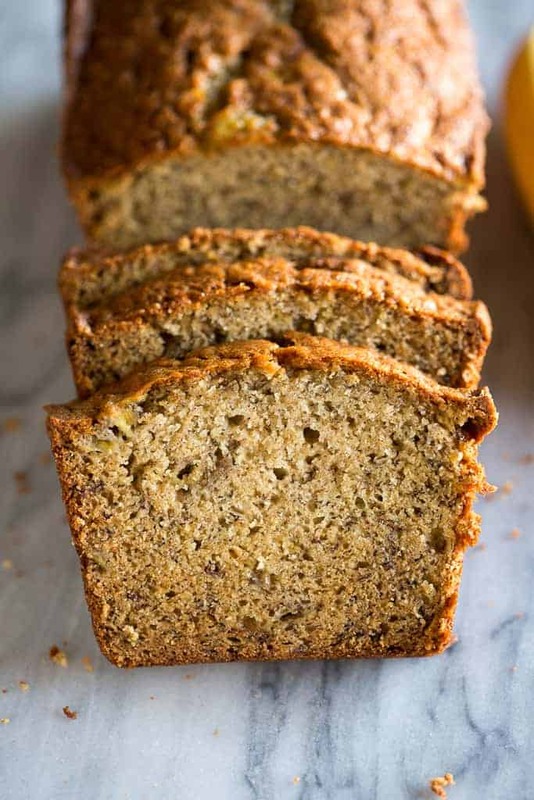 You can store banana bread at room temperature for 3-5 days. You can also freeze banana bread. I do this often with banana bread or with banana bread muffins and they freeze perfectly! To freeze banana bread, allow the loaf or muffins to cool to room temperature and then store them in a freezer safe ziplock bag, removing all the air that you can. Freeze for up to 3 months. To thaw the banana bread, simply take it out of the freezer and let it come to room temperature before serving. Banana Nut Bread: Simply chop your favorite nuts (I love to add walnuts) and gently stir them in the batter at the very end. Chocolate Chip Banana Bread: Stir in a cup or more of chocolate chips to the batter at the end of preparation. 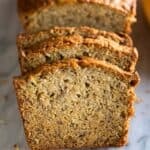 Healthy Banana Bread: I often make a healthy banana bread with a few small changes including cutting the sugar in half. Check out my Skinny Banana Bread or Skinny Banana Bread Muffins. 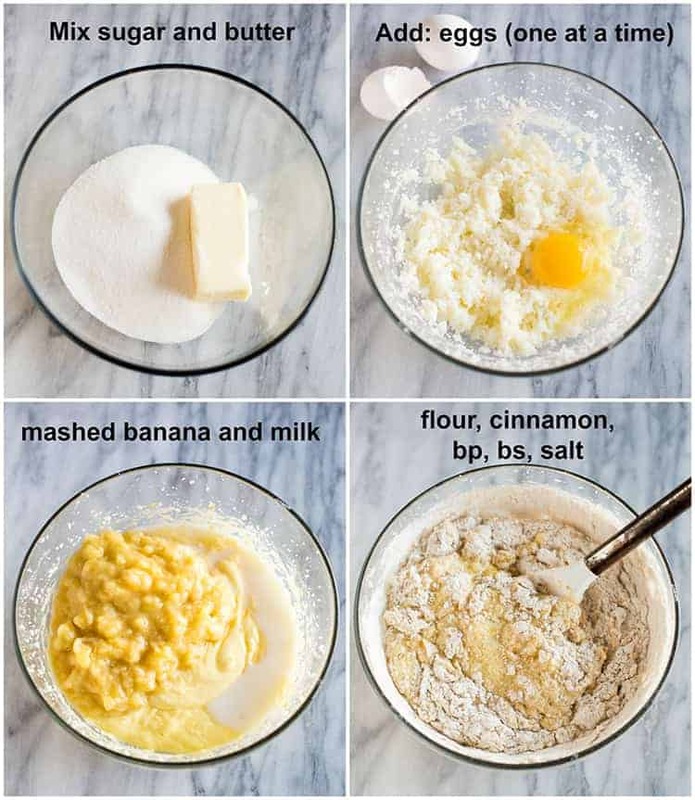 You can use this recipe to make banana bread muffins, if you’d like. Make the batter the same but bake them for around 20-28 minutes. 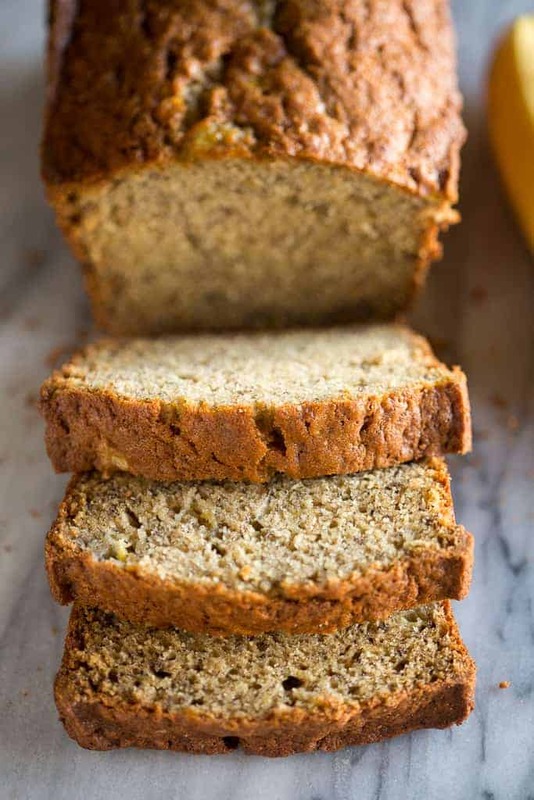 Our family's very favorite Banana Bread Recipe is EASY, moist, simply perfection! Look no further for a fool proof banana bread recipe. *I first shared this recipe in June 2010. Updated January 2019. Can v use brown sugar or jaggry instead of sugar?? Yes, I used 3/4 cup of brown sugar and a tablespoon of cane sugar, instead of white sugar. If you’ve already done this, then you know, but the flavor of the banana bread has a very nice, light molasses flavor. Toasted slices with butter or sharp cheddar cheese (yes…cheddar), is fantastic. Yes I did cut down my salt and then it became perfect. I blamed my saltiness on maybe I used salted butter that’s why. If you are vegan, you can substitute milk for almond milk and 3 eggs for 3 tablespoons of flax seed and 1 tablespoon of water. It works just fine! I made some of this banana bread for breakfast, and it turned out great! My boyfriend and I both love it! Excellent! The step by step photos were really helpful and the loaf turned out perfectly. Still moist and delicious even a few days later. I made this as my first time making banana bread. It turned out wonderfully! I added pecans and it was delicious. It was a bit dry but I’m sure I just need to work on my technique. Thank you for this recipe! I have a question : is all bread having 223 kcal oraz one slice? and could I use honey , not sugar?